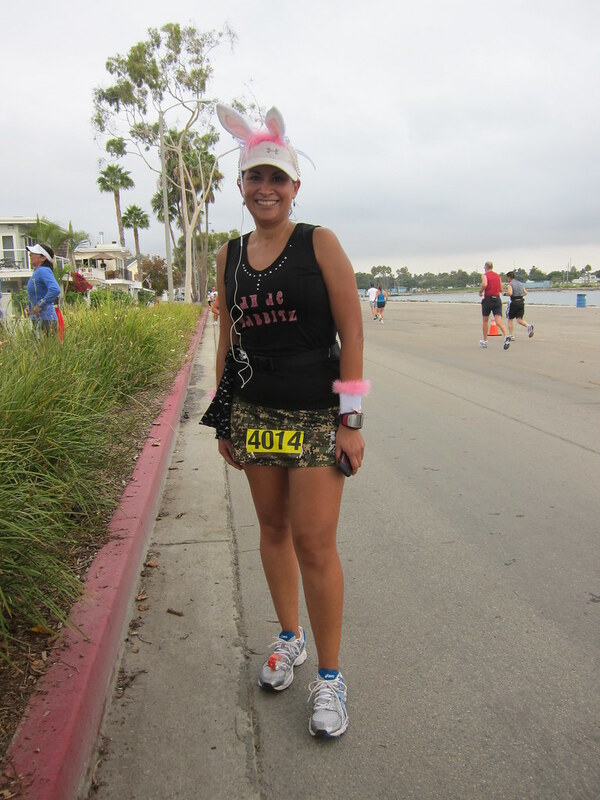 The Green Girl had the opportunity to be a cheerleader at the Long Beach Marathon today. 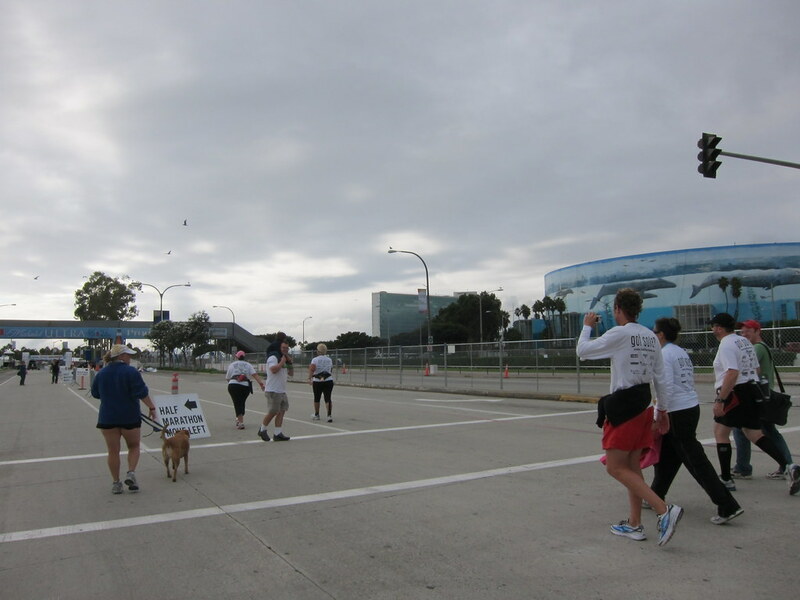 The Sole Runners kicked off Saturday morning together at the Expo. Coach Steve gave us some last minute encouraging words of advice and we took a group picture. Afterward, Michelle, Rozie, and I stopped for some breakfast together. Later on in the evening, Michelle, and I joined Alice from HefferBlog, Glenn from The Running Fat Guy, Jay from Tri2Thrive, Mags from Run Happy, Penny from Planet Ynnep Running, Penny's dad, and some other runners at La Parolaccia for some carbo-loading. 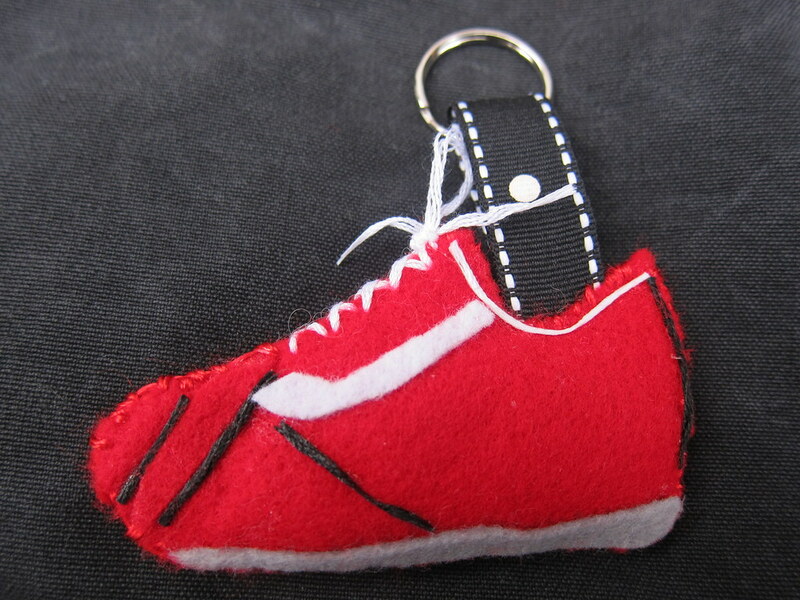 I gave Michelle a Sole Runners shoe keychain made by Mostly Even, Sometimes Odd on Etsy as a good luck charm before the race. This morning, in preparation for my cheerleader duties, I crammed as much sports nutrition as possible in my Nathan Speed 4 hydration belt; packed bite-sized peanut butter and jelly sandwiches; brought frozen Zico coconut water and electrolyte water in a cooler; picked up the Starbucks cappuccino I had promised one of the Sole Runners, Richard; and posted myself at Mile 13. I watched in awe as the elite runners sprinted by. I cheered on Sole Runners and strangers. I screamed loudly in support of all the pace groups. I watched as Boston qualifying dreams were shattered when runners realized at the halfway point that they would not make it in time. Speaking of arm's length shots, I saw Rad Runner Girl. I gave her some electrolyte water and attempted to run with her for a bit but her pace was too much for me and I had to tap out after a few blocks. I left a bottle of coconut water with her husband for a recovery drink. Jessica 'Wabbitz' stopped to wish me good luck in Athens. Before I knew it, Michelle had reached Mile 12 just across from Mile 13 so I quickly grabbed the remaining bottles and headed out with her. My friend, Jackie, caught up with us on her bike after completing the Bike Tour. She was kind enough to bring a container of fresh sweet pineapple slices and some extra water. As the miles got longer, Michelle commented that the Sole Runners tent would probably be long gone but I reassured her that it would still be there for us to help keep her spirits up. Around Mile 23, one of the Sole Runners, LeAnn, called to check in on us. I let her know we still had a few more miles to go. 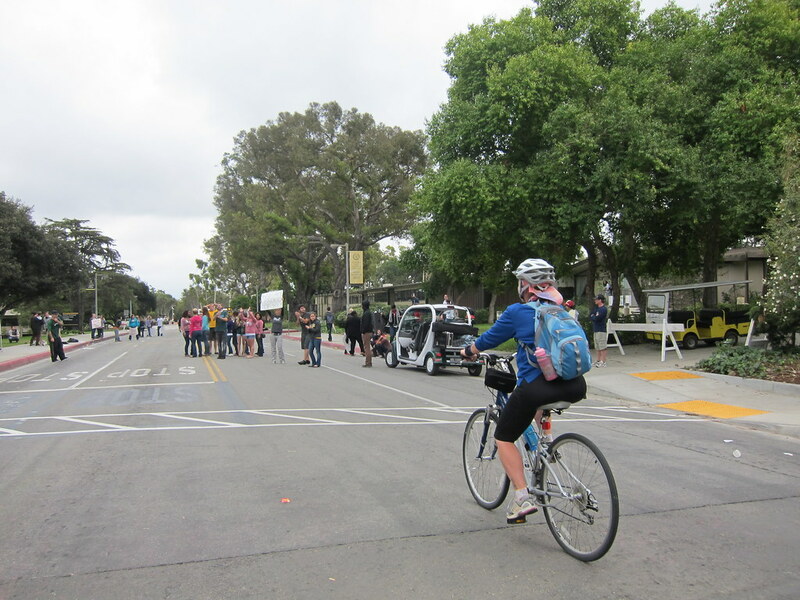 When the Finish Line was in sight, Michelle asked me to go ahead so I could get a shot of her crossing. 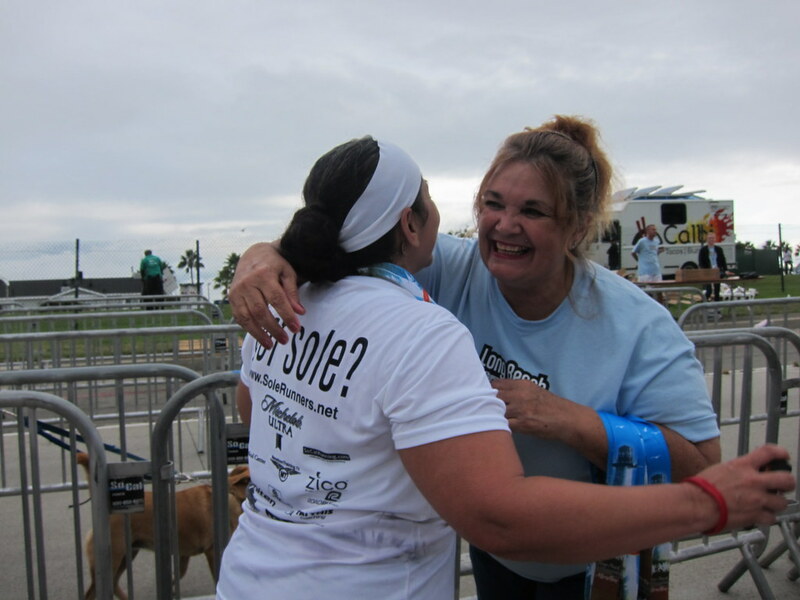 I ran as fast as I could and as I approached the Finish, Sole Runners started cheering loudly. As I crossed over the Finish, I politely declined the medal explaining I was simply a cheerleader and got into position to get pictures of Michelle. Just then, someone mentioned if I still had runners coming that I would have to ask them to hold a medal because they were being put away. I started yelling violently to please hold some medals as I started snapping pictures of my friend. They did hold some medals and, to my relief, Michelle got a medal as she crossed the Finish. After congratulating Michelle, I hurried back to the medal area to make sure they had enough medals for the three remaining Sole Runners who were still out there. As soon as we spotted the last three Sole Runners, we all ran out onto the course and surrounded them with cheers and smiles. One of the mentors, Mariela, chanted encouraging words through a megaphone. As we walked the 'newly' marathoners to the Sole Runners area, I suddenly realized the Sole Runners tent was the very last tent standing. Coach Steve had refused to take down the tent until the very last Sole Runner had crossed the Finish Line. In addition to running the marathon himself, Coach Steve made sure every last Sole Runner completed the race - no matter how long it took them. And it wasn't just Coach Steve, other Sole Runner mentors and Sole Runners hung around for the back of the packers. I became so overwhelmed with emotions that I started crying. I was so proud of Michelle and the emotional and mental fortitude she displayed today. 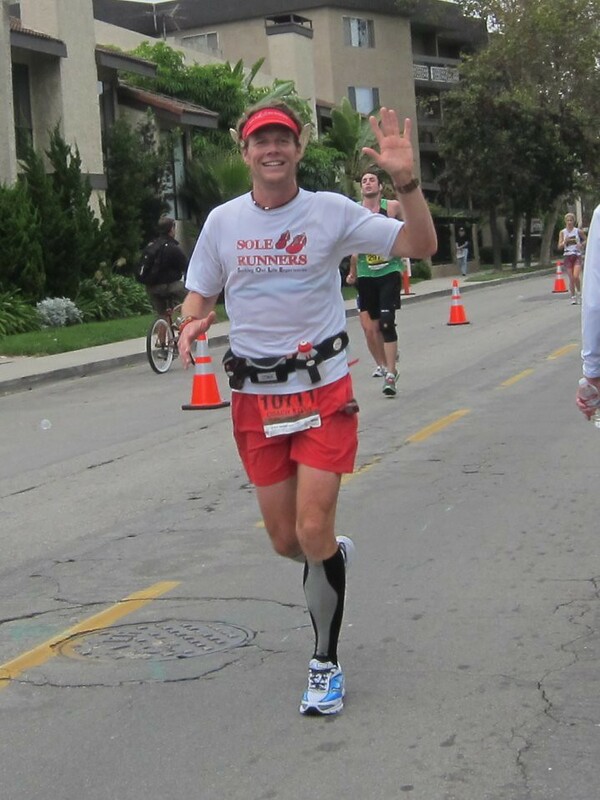 I was so inspired by all the first time marathoners who ran 26.2 miles for the first time in their lives today. I am so proud to be a Sole Runner and to be a part of the best running group in the world. Love that pic of the two of us!! What a wonderful recap - hooray for Michelle!! I saw so many SOLE Runners on the course, hollering for each other and cheering each other on. I was incredibly impressed by (and just a little jealous of...) how supportive you all were! What a great group of people to run with! And you are one excellent cheerleader! Love all your guys' support. That's so awesome!! This is one cool group of runners. With people like that anybody could enjoy running. Wow, that is great! Fantastic that you could support and meet up with so many people. Have a good week! I want to go run with you - you sound like you have the best snacks! Congrats to all the 1st time marathoners! That is awesome! You were so freaking awesome out there! The smart water and our quick chat literally kept me going for the next miles to come that were quit boring.. I was so happy yesterday with my decision to become a Sole Runner, I continuously yelled GO SOLE Runners, whenever I saw one of our kind :) Thank you for probably the most unattractive pic you have taken of me :) But your arm shot with P came out great! I would LOVE it if you were my cheerleader in a race, you are so awesome!!! I did some cheering this past weekend, too. FUN!!! Completely jealous. NOTHING like a great support team. YOU MAKE THE BEST DAMN CHEERLEADER!!! I got tears in my eyes reading this. So INSPIRING! That must have been so fun and rewarding. You are looking to have the comrardarie (where's the spell check on this thing). Ooops, I meant lucky. Strike 2.
oh, this made me smile! 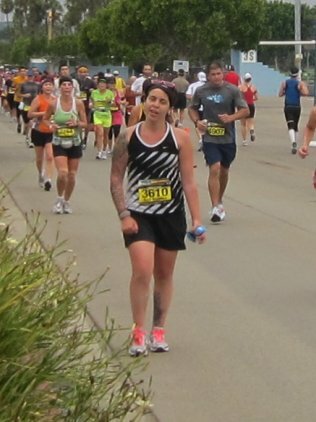 Marathons are so inspiring and emotional, I would have cried too! I'll be there this Sat! Getting pretty antsy not running or exercising.. which is a nice change from my usual injury/pain following long runs/races. 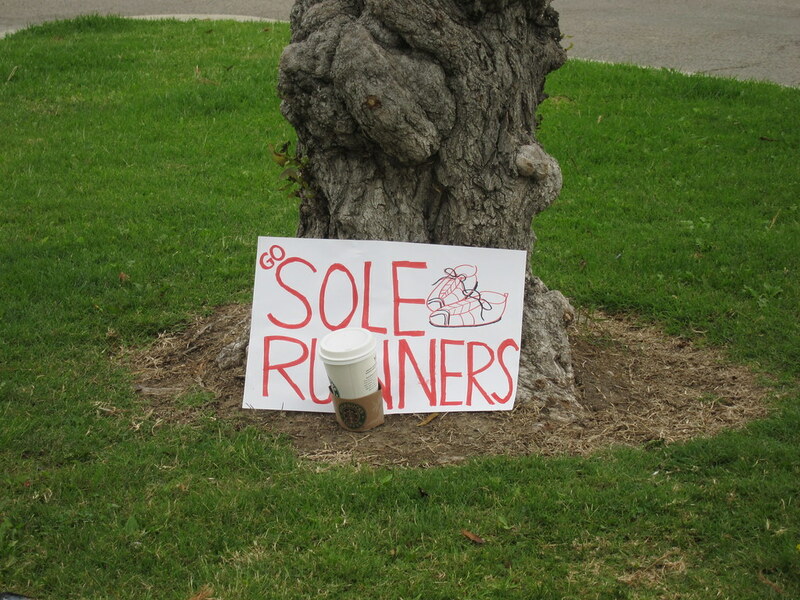 Looking forward to Sole Runners! Glad we finally met! See you Saturday. That sounds really fun. I need to get more cheerleaders at my events. Great writeup! What a fun group--and what dedication for a runner to sit on the sidelines to watch others run! Your group is lucky to have you and your enthusiasm!